This week in Blood there was a very interesting article published on a very rare form of blood cancer, LGLL or large granular lymphocytic leukemia. T-cell large granular lymphocyte leukemia (LGLL) is a rare clonal disease often associated with rheumatoid arthritis (RA) and manifests chiefly as neutropenia and recurrent infections. Immunosuppressive agents are the mainstay of treatment, but long-term remissions are rare. We report 2 cases of LGLL in patients with RA successfully treated with rituximab, a monoclonal antibody specific of B cells and approved for treating RA. The first patient experienced a complete LGLL remission that was sustained during the 8-year follow-up after the first rituximab infusion. In the second patient, rituximab therapy was followed by immediate neutropenia recovery and then by marked shrinkage of the LGLL clone 1 year later. The paradoxical efficacy of this specific anti–B-cell drug on a monoclonal T-cell disease suggests that some cases of LGLL may be reactive manifestations of chronic autoantigen stimulation rather than true malignancies. I added the bold because this jamming on of reactive pathways with all its nasty downstream consequences is similar to what we are trying to block with BTK and PI3K inhibitors in CLL. In CLL, we are trying to shut down the constitutively stimulated B cells by blocking their pro-survival communication, proliferative, and homing instincts. As illustrated by our first patient, T-cell LGLL is frequently associated with concomitant low-grade B-cell dyscrasias, such as monoclonal gammopathy of unknown significance or chronic lymphocytic leukemia, suggesting that a common antigen may drive both T- and B-cell proliferation. That is powerful talk. Yet to be proven, but worthy of more research. Maybe that is why anti-T cells therapies such as ciclosporin help some in CLL, yours truly included. Everything in the complex immune system is so connected. The whole Blood article is short and I recommend it. This type of creative systemic thinking is exactly what will be needed to completely and finally shut done the monoclonal B cell factory that is CLL. We may need to read the green tea leaves in more than our CLL teacups to find our answers. We need to look at the research being done in other liquid and solid cancers. Some of the fantastic new immune therapies in metastatic melanoma as detailed in my prior post from ASCO 2013 immediately come to mind as future paths to pursue. Last, but not least, and while the issue may be just semantic and this is only two cases, all of us with CLL would much prefer to live with a "reactive manifestations of chronic autoantigen stimulation rather than true malignancies", especially if such labeling leads to better therapeutic approaches and better outcomes. I am off to Germany on Monday for iwCLL. Send me your burning thoughts and questions that I might share with all the CLL gurus gathered in Cologne. ASCO 2013: Dr. Jeff Sharman on Mantle Cell Lymphoma (MCL) and Coffee and Road Map. Dr. Sharman is a great educator with a super blog on CLL and NHL (Non-Hodgkin's Lymphoma) talks about MCL. He points out the specific challenges with MCL and why the changes coming to treatment for other B cell lymphomas such as CLL might be even more helpful in this particular nasty cancer. While not speaking specifically on CLL, the drugs he discusses should be familiar and his explanations of mechanism of action are both clear and creative- like coffee and road maps. I will be interviewing Dr. Sharman and many others at iwCLL, a CLL specific conference in Cologne, Germany in a few weeks, so stay tuned. Please let me know if you have any burning questions. Again my thanks to the team at Patient Power with whom I worked at ASCO. Andrew Schorr and his team do important work for the CLL and cancer community, and it has been a pleasure to pool our energies and resources. It has been six weeks since my previous infusion of IVIG for my now well-behaved ITP and my platelets remain near 400,000, a very healthy level. Post splenectomy counts tend to run a touch higher than normal limits but it certainly seems with these results, I can safely stretch out visits to the cancer center to every seven and then eight weeks. Dr. Byrd is behind this as long as my trough IGG (immune globulin G) level stays > 600. That level is a bit below normal, but safe. My absolute lymphocyte count remains nice and low. Neutrophils remain rock steady. Monos remain a touch high. All good. The only slight annoyance to an otherwise joyous lab report was the slight drop of my hemoglobin to 13.1, back into the mildly anemic range. Last time it was 14.4. The time six weeks before that was 14.6. Those last two blood counts represented the first time since my hematopoietic stem cell transplant more than five years ago that I have had two CBCs in a row that showed no anemia. However, if I look back to April 2013 my Hgb. was 13.2. I was hoping it would be staying in the > 14 gram range and maybe even start to climb to where it was pre-CLL in the high 15s, but it continues to bounce around in a narrow range of low normal to normal. I refuse to be concerned unless I see a downhill trend. What I see instead is this pattern of the same minor ups and downs over the last three years of blood counts. I teach others that in most circumstances, one blood count in CLL means little. It is the trends that matter. I will listen to my own counsel. So no worries. At least until my next infusion seven weeks from now in October! My veins are so happy. Talking about IVs, while here with a needle in in my right arm, I spoke with a young CLL friend doing well after HDMP+R (high dose methylprednisolone and rituximab) at UCSD with Dr. Castro who now is considering a Campath mop-up. With his blood clean and no abnormal nodes, he has only < 1% CLL left in his marrow. He is less inclined, and I agree, to follow such a course with all the new meds in the pipeline. The calculation of the risk benefit ratio of prolonging the remission versus the real danger of serous infection from the knocking out of the B and T cell population with Campath may be shifting. And I Skyped with a friend in Ireland whose wife with CLL has a growing solitary cervical node and a upper respiratory infection on the same side. We discussed the differential diagnosis with a reactive benign node (the typical nodes that swell in response to an infection) being number one, relapse number two, and Richter’s the least likely in the absence of a rising LDH and more malaise. Also she was only received rituximab therapy in the past, has no high-risk deletions, and is mutated, making the last diagnosis even less likely. I point these two cases out to remind us all that there is no one size fits all in CLL, and along the way, we are faced with a myriad of big and little decisions and worries. Here are three comments that tell a very different story about the risk of sharing the CLL news. Would that the world was different. My hearts especially goes out to the first anonymous commentator, who ironically is not so anonymous at church and home. He speaks poignantly of the cruelty of friends and family and the kindness of strangers. Strong arguments for keeping our mouth shut, when possible. For the origins of this discussion, please see my recent post on the death of George Duke, the follow-up post with a related comment and my much earlier post on the CLL death of Jill Clayburgh. I can't relate to what you are saying and the experience of others you have described. I told everyone I knew about CLL, people I trusted and loved. In doing so, over time, my friends and close family deserted me, my church didn't understand and wasn't able to relate how ill I was nor provide me with the support I needed, eventually I left that church. You see for me CLL, in combination with another chronic illness, made me very ill, so ill I couldn't work anymore and I lost my job, lost my career, my friends started to distance themselves and so did my close family, it was as though I were leper. Now it is rare for any of those to phone to ask how I am, none offers to help; none visits; only my wife supports me. I use to be always the one who would keep in touch and phone and see friends and family, but now when I am in greatest need all I get is silence. Old friends busy themselves with self interest activities, I use to ask them to meet me for a tea or coffee but they always had some excuse not to meet, same goes for close family, I haven't seen my brother and sister for many years even though both are capable of visiting they choose not to. So I've given up hoping anything from them anymore. Even the medical profession has been woefully poor in providing support, so often I (and my wife) have been left to fend for ourselves. Only now my life is close to the end does anyone seem to care, and those who do have been strangers, and at last this has got my sisters attention and she shows some concern and occasionally phones but alas it's usually a case of her saying something like "keep me posted etc. ", same old habits same old complacency. The strangers are people on CLL forums, people in palliative care, people who can relate to illness, suffering and ultimately have known people who have died. They provide words of comfort, they put an arm around you and hold you as you cry, they make you a cup of tea and offer you food, they help you walk and support you as you struggle to walk or stand. These are the real angels in this world, these are the people with love and compassion in their hearts, and these are the people who share your pain and suffering. Yes, there really are good Samaritans in this world, however there are others who choose to look the other way and walk by on the other side, but the ones who have love and compassion in their hearts are angels in this world. The problem often lies in what you must reveal due to medical appointments. I went through a clinical trial and never missed a day of work except for days when I had infusions. I elected to tell a very small number of people who were in my direct line of reporting so they would understand my need to specify firm dates out of the office. Unfortunately a couple of those people chose to tell others out of "sympathy." Within a few days, I was inundated with cancer doe eyes, the sorrowful misty look one gives when talking about Old Yeller. Needless to say I was irate over my supervisors revealing a personal medical matter. Cancer puts you in the lineup of those due to checkout next. You are denied opportunities, treated as a lesser entity and suffocated by the premature sad news of your demise. I managed to set things straight by doing my job at a high level of productivity, much to the dismay and even annoyance of my family. But you can't show fatigue or you are out of the game. Some people started talking about my retirement, something I neither wanted nor could afford due to health insurance issues. We all have different circumstances and needs, but I would opt for silence. Couldn't agree more with (another) Anonymous writer, especially this: "Within a few days, I was inundated with cancer doe eyes, the sorrowful misty look one gives when talking about Old Yeller ... Cancer puts you in the lineup of those due to checkout next. You are denied opportunities, treated as a lesser entity and suffocated by the premature sad news of your demise." I'm not so concerned about keeping or moving up in my job as to seeing the pitying eyes, etc... Since I'm mutated and haven't had treatment since diagnosis in 1/06, I would most likely have to deal the cancer label for quite some time. Only my family (including extended) and one close friend know I have CLL. I have been approached again to help with recruitment for CLL patients to be interviewed, this time in Manhattan. This is not a clinical trial, but likely more an attempt to gather medical marketing information about what most matters to us as patients. The teams are usually very professional and it can be a fun experience to put our real world imprint on how CLL is viewed. I did a similar one years ago and it was a hoot. And a dear CLL friend made such a strong impression during the interview in that same survey that subsequently he has been flown across the country for photo and video shoot and is now the poster boy in innumerable magazines for an important CLL drug. If you are interested, please see the flier below. In lieu of paying me for this announcement, I asked the sponsor to make a donation to LRF (Lymphoma Research Foundation) which they promptly did. 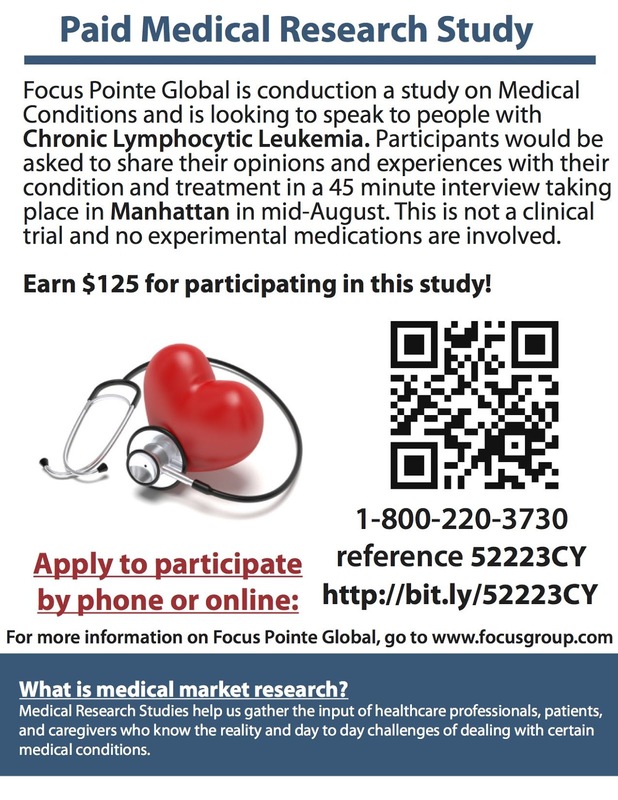 If you do decide to do the "study", please let me know and also please tell the folks at Focus Point Global where you found out about the opportunity. Please pardon their typo (conduction instead of conducting), but who am I to talk. The following personal note on whether to share our cancer diagnosis or keeps the battles secret was send by one astute and candid commentator in response to my recent post about George Duke. This anonymous well written and considered comment deserves to be seen by more than those few readers who always check out the many thoughtful comments from my readers and fellow travelers. I can so relate to the writer's experience of the pitying looks and the pre-terminal planning that a cancer diagnosis seems to foster. You might also want to read my almost forgotten post from nearly three years ago written when Jill Clayburgh died of her CLL keeping her secret to the very end. So much has changed in those three years, but when I reread my thoughts from back in November 2010, I was pleased to see that I can still relate to what I wrote back then in what was a very different world for those of us with CLL. It is so great to be young again. Who is having the better time? 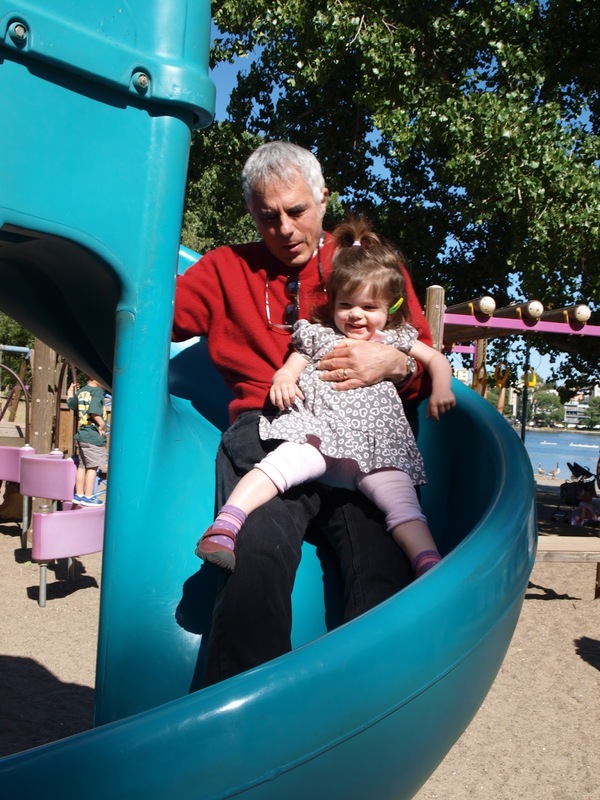 Me or my granddaughter Amira? You are looking at one of the big reasons I celebrate the blessing of my fine remission. More CLL news and great videos from ASCO soon. 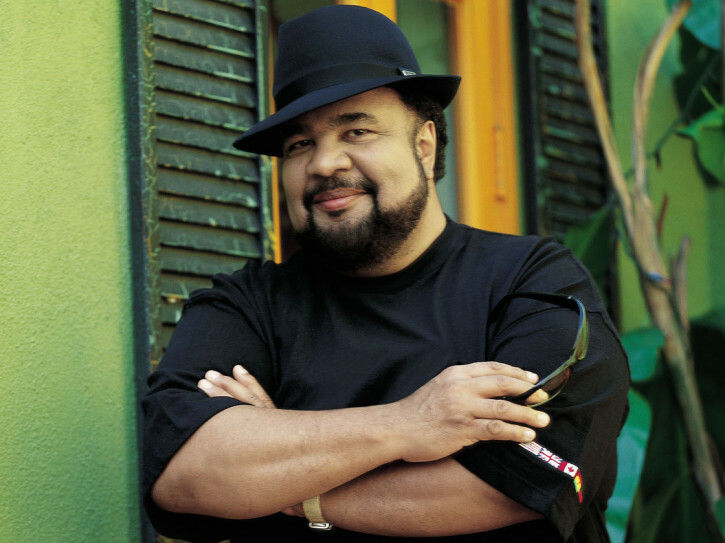 "Jazz, funk and soul keyboard maestro George Duke (pictured) passed away at the age of 67. The musician reportedly battled chronic lymphocytic leukemia, according to his record label, Concord Music Group." says a score of press releases. I am sadden by the loss of this great musician at a relatively young age, and I send my condolences to his friends and his family. This is the first I heard that he had CLL. I totally respect his decision not to share his struggles. "He was battling and being treated for chronic lymphocytic leukemia (CLL)." is the only clue we have. Was his end a complication of his treatment? The press release hints at that. Or maybe not. I wonder what therapies he accessed? Was a clinical trial part of his path? Did he try any of the new small molecules or mAbs? Was he cared for by a CLL expert? When I hear, again and again of a TV or music or movie star who dies of CLL, I really do respect and understand their decision to hide their disease from their fans, and often I am sure from most of their colleagues. Might lose work if someone knew that you had cancer and the entertainment and many other business are very competitive and very phobic about any illness. And besides, it's about the art, not the cancer. Many hide CLL simply because they can. Most therapies are outpatient. Surgery is almost never indicated (maybe a rare lymph node biopsy or a splenectomy for intractable AIHA or ITP). We don't generally lose our hair or drastically drop our weight or even look much like a cancer patient is "supposed to look." It is easy to hide CLL to very near the end. And it is going to get easier and easier with the new oral drugs in the pipelines. We are not quite there yet, but it may be becoming less and less of a visible and burdensome disease. Easy to hide and getting easier. Hiding our CLL focuses our lives and our relationships on topics other than our cancer. It forces us to compete in work and play without playing the "cancer card" for sympathy and a leg up. We spare family and friends worry and concern that is often needless, especially if we have very indolent disease. We miss the support and knowledge of others who might be able to help us and whom we might help by sharing out experience. It's a give and take that only comes from sharing our truths. We don't expand the general awareness in the community of the gravity of the disease, the need for more research (and funding) for the promising new and improved treatments, and despite our best efforts, the human toll of our killer. We are competing for scare resources with much more visible and active cancer advocacy organizations. We deny family and friends a chance to support and care for us. We deny a part (but not nearly the whole) of who we are, when we don't share the raw truth of our illness. For each of us, we must decide whether to come out of the CLL closet. Just as in treatment, there is no one size fits all in the world of CLL. I understand and respect George's decision to play his cards close to the chest. I have chosen to play mine in the public eye.